Larva is 91 days old. 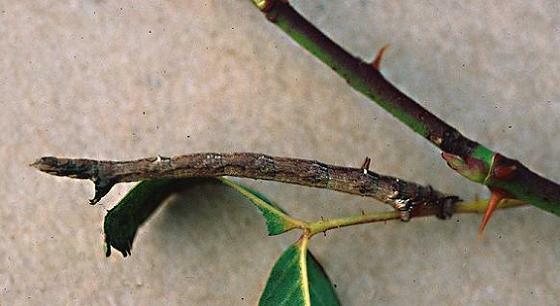 Notice how its protrusions appear to match the thorns on the branch of the Rose. Notes from data base: "Placed larvae in cold fruit cellar for the winter, since they did not appear to be thinking about pupating and I was running out of food plant. The larvae were still clinging to the Rose stem. They stayed that way all winter. When I took them out of the fruit cellar on May 15, 2002, the caterpillars were dead."